Silk H 87 cm, W 89.5 cm without the cover of the flagpole, with 94.5 cm (without fringe), divided into three bands of equal width of 29.5 cm, blue on the right, white and scarlet on the left . The blue part is increased by a sheath of the same color for the passage of the shaft (L 5 cm). 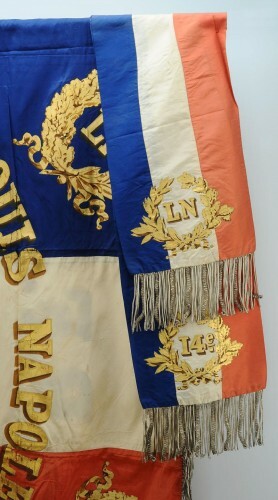 In each corner and on both sides is painted, a golden laurel wreath surrounding the letters "LN" (at the top of the blue part and at the bottom of the scarlet part), and the number "14" (at the bottom of the blue part and at the top of the scarlet part). Medium silver bangs, L 5 cm, they are flexible of the model called "rope to rain". 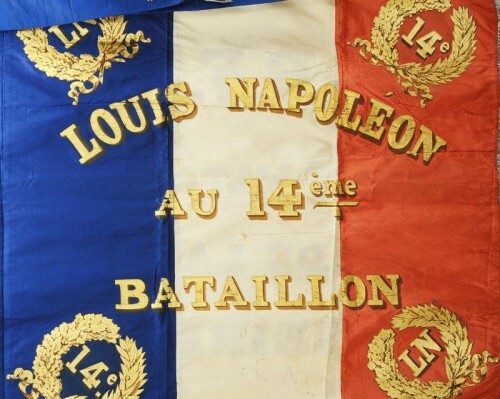 The obverse is painted gold: "LOUIS-NAPOLEON / 14th / BATTALION", and on the reverse: "RF / GARDES NATIONALES / DE LA / SEINE". Silk tie, also composed of three bands in three colors, l 20.5 cm, total L 91 cm (without the fringes). Fringes silver half-end said model called "rope rain" mixed with fringes with big broth said "seed of spinach", L 8.5 cm. 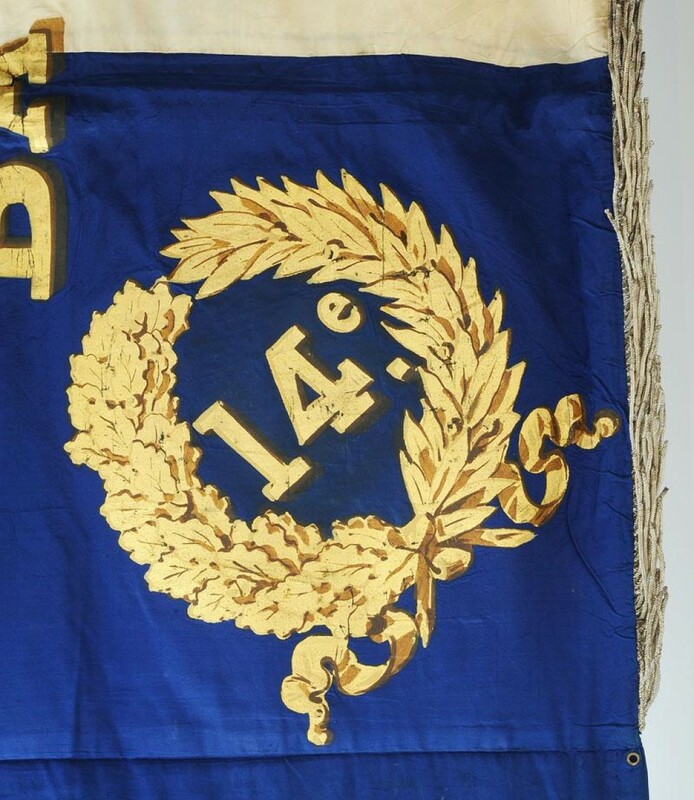 It is painted at each end, on the obverse only, with a golden laurel wreath, surrounding the letters "L N" and "14". State close to new. La France. Presidency of Louis Napoleon. 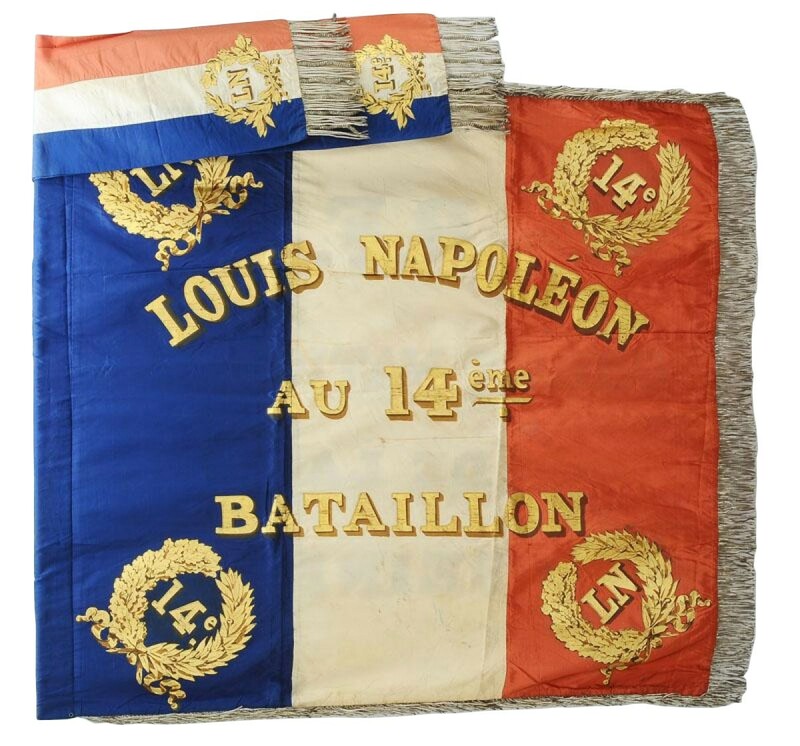 KNOWN EXEMPLARIES: To date, we have listed 10 model 1852 models for the provincial national guards (Evreux, Dreux, 1st battalion of the city of Orléans, Reims, Rouen, Vitry-le-François, Boulogne, Saint-Germain-en -Laye, gunners of Lille), and only one for the Seine, that of the 14th battalion. 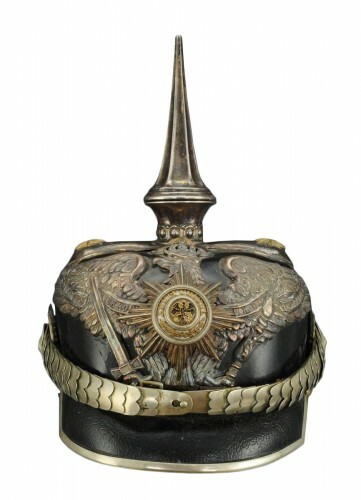 The model 1854 of the National Guard of Saint-Denis and Blois, and 9 copies for the Seine (17th Btaillon, 29th, 37th, 40th, 43rd, 44th, 45th, 48th and that of the cavalry of Paris). HISTORY: On December 31, 1851, President Louis Napoleon ordered the restoration of the French eagle on the flags of the army. On March 4, 1852, the direction of the artillery sent to the minister of war, for approval, a type of eagle executed and proposed by Auguste Barre, sculptor. The first market provides eagles big model for flag and small model for standards. Finally, only the large model is retained. In July 1852, Marion executed a first model for the 109 eagles to overcome flags and flags of the battalions and squadrons of the National Guard. These eagles of a very different design from that of army eagles have their heads turned to the right and are silver. 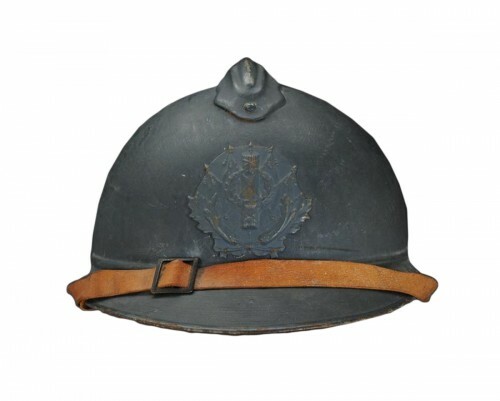 On the box, on the obverse, the letters "L N" and on the reverse the name of the department with, below, the number of the battalion or squadron. The Army Museum retains the plaster model and the eagle of the 24th Battalion of the Seine on the caisson: "LN / SEINE / 24". Unlike the rules, this eagle is golden. These eagles were surrendered on August 15, 1852. Intended primarily for the maintenance of order, the National Guard is composed almost exclusively of infantry. Each battalion has a second lieutenant flag bearer. 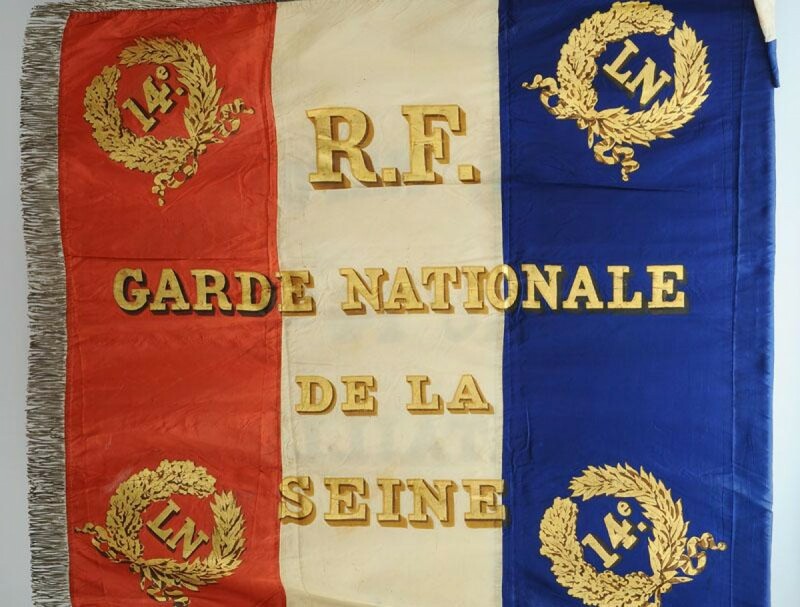 In July 1852, Marion was commanded by the flags of the National Guard: 52 flags for the battalions of the Seine and 2 standards (legion of cavalry of Paris and squadron of the suburbs), 54 flags and a standard for the battalions of province, figure increased thereafter. For the national guard the flag is the model of the line 1852, with in each corner and on both sides a golden laurel wreath surrounding the letters "L N". Silver half-end bangs. 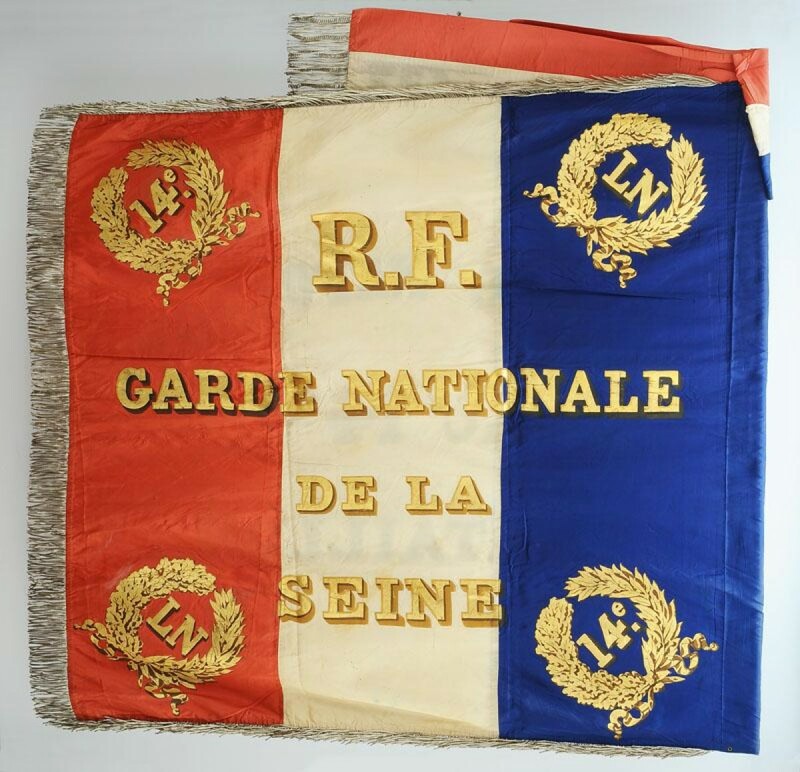 For the making of these flags, the Minister sends to Marion 250 new flags dating from 1848 having a usable blank side, the other side bearing French Republic. Marion also uses the poles and fringes that he had to silver because they were gilded. 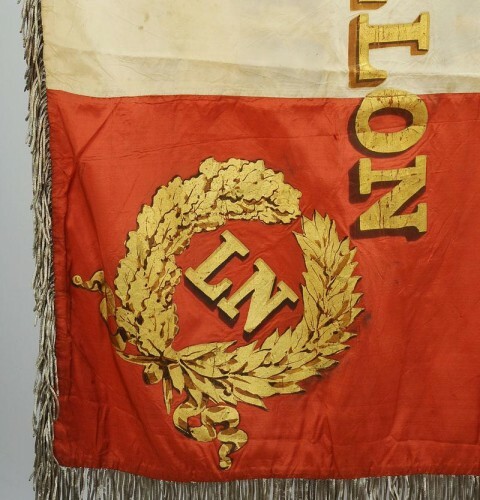 The inscriptions on these flags follow the following prescriptions: a) Cities in which only one battalion is organized. Obverse: NATIONAL GUARD OF (name of city). Reverse: DEPARTMENT OF b) Cities in which it is organized more than one battalion. Obverse: CITY OF BATTALION N °. Reverse: NATIONAL GUARD OF (department name) c) Special Weapons. Obverse: TOWN OF BATTALION OF FIREPLACE STEPS or RODS. Reverse: NATIONAL GUARD OF (department name) d) The above regulation is not followed for the Seine department. The emblems are given on August 15, 1852. Obverse: GARDES NATIONALES / DE LA / SEINE. Reverse: Battalion number. Model of the standards: Obverse: LOUIS-NAPOLEON / TO THE / LEGION OF CAVALRY / DE / PARIS. 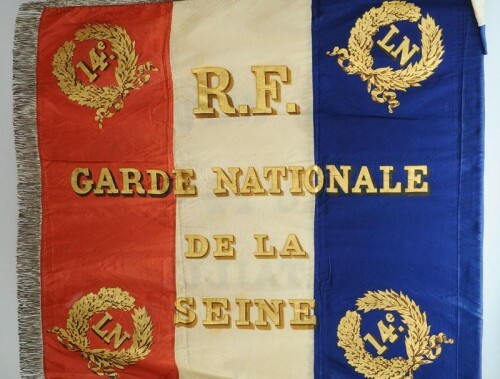 Reverse: NATIONAL GUARDS / LA / SEINE. Note that the 1st suburban battalion following the 22nd battalion of Paris took the number 23 and so on. The making of these flags began in July 1852 and continued until the end of 1853. All the objects are sent by registered mail, assured, either by post, or by express carrier (FEDEX, UPS, DHL…).